The need for new therapies to combat drug-resistant pathogens is one of major public health concerns. Candida albicans is common yeast that infects in humans and the fourth most hospital acquired infection worldwide. Essential oil is on top of the hydrosol layer during steam distillation and widely known for its antimicrobial property. However, less information is reported on the activity of the hydrosol. In the present study, nine hydrosols were obtained by steam distillation of nine aromatic plants in South Vietnam, namely, Acorus calamus, Coriandrum sativum, Ocimum basilicum, Litsea cubeba, Melaleuca alternifolia, Cymbopogon nardus, C. citratus, Citrus hystrix, and C. sinensis, and anti-yeast activity of these hydrosols was evaluated against the growth of C. albicans. The results indicated that the hydrosol from L. cubeba exhibited the highest anti-yeast activity (MIC = 10%, MYC = 25%), followed by those from C. nardus, C. citratus, and O. basilicum. The remaining hydrosols showed low or no activity against C. albicans. GC-MS data show that the main essential oil constituents of the hydrosol of L. cubela were neral (32.92%) and geranial (27.12%). She received Ph. Degree in Agricultural Biotechnology, Seoul National University, in February, 2013 under the supervision of Prof. Young-Joon Ahn. During PhD. student period, she carried out studies about antiviral and antimicrobial activities of plant extracts or compounds against human rhinovirus and gastrointestinal bacteria including Helicobacter pylori. 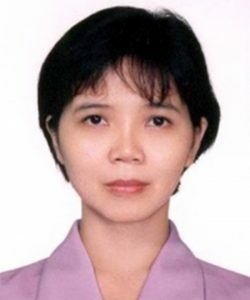 After graduating, she has been working as a lecturer at Faculty of Biology and Biotechnology, University of Science, Vietnam National University Ho Chi Minh City. Her work currently focuses on antimicrobial activities of plant and fungi preparations against harmful fungi and bacteria such as Candida albicans, Salmonella Typhimurium, Staphylococcus aureus, Klebsiella pneumonia, Pseudomonas aeruginosa and Helicobacter pylori.